"These two pets were rescued and have now become the best of friends." 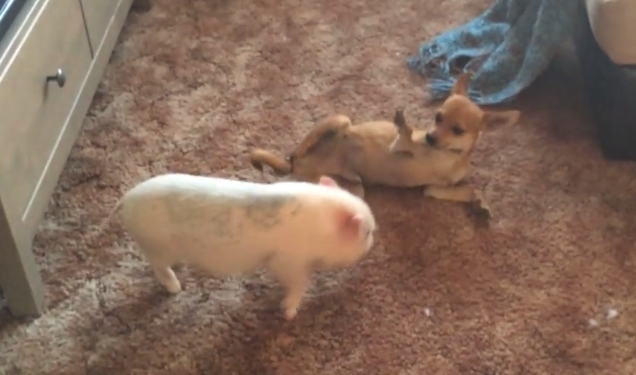 Marcel the pig and Ralphie the chihuahua wrestle and roll around together just like brothers — because they are. The two are both rescues, their human wrote on YouTube, and now they're the best of friends. After a day of tousling around like this, both piggie and puppy probably sleep very soundly. Interesting Fact: The Chihuahua is named after the Mexican state of the same name. Dog effigy pots, some nearly 700 years old, have been found in the Chihuahua region in architectural digs. The dogs in these pots resemble Chihuahuas, and hence, the current name. Expanding on Chihuahua’s ancestry, there is significant consensus among scientists that the breed possibly descended from the Techichi, a companion breed popular among the Toltec people. Pots resembling the Techichi breed have been found in Mexican tombs dating back to 300 BCE, indicating that the dogs had high status, or were, at the very least, beloved companions. Responses to "Rescue Piglet And Chihuahua Wrestle Like Brothers (Video)"